The winter and spring are long and barren for a football fan, especially one who follows Chip Kelly. The Eagles coach speaks to the press only at press conferences, and he basically doesn’t have any from the day the team cleans out its lockers after its final game until organized team activities (OTAs) start again in late May. There are a couple of exceptions — one or two during free agency, the required hour meeting with the press at the NFL Owners’ Meeting in March and a sudden flood of press conferences during the draft, one after almost every pick. But those are gulps of water from a small oasis for desperate men and women crawling through the desert. This week, we reached the end of the desert, the lush verdant valley of the OTAs, and Thursday’s was the first one open to the media. If you think I’m overstating the eagerness of the press to hear what Chip Kelly has to say, consider this: there were 90 players at the practice, a full roster. But there were 105 credentialed reporters there – at a practice in May – and there would have been 106 if I wasn’t 3,000 miles away in Oregon. 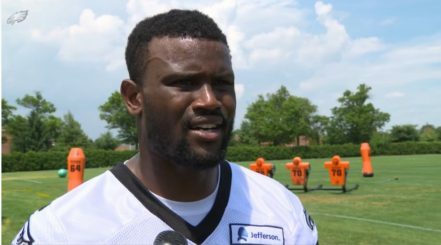 1) Former Ducks star CB Walter Thurmond has converted to safety and has a decent chance of starting this year. The Eagles picked up six cornerbacks and no pure safeties this off-season, with equally desperate needs at each position, so it was a shrewd move by Thurmond. He had never played the position before the team approached him with the idea three weeks ago. He’s always around the ball. I think he’s had a lot of experience playing nickel, so he’s been an inside guy. He can see things. He’s very intelligent. He’s an intuitive football player. He is the first guy out of that corner mix that is getting a shot at inside. Walter Thurmond, newly minted safety, at OTAs. 3) Kiko Alonso is back fully from his ACL tear last year. However, Earl Wolff and Marcus Smith II were still both hobbled by their injuries, and that’s not a good sign for either. Kelly can be harsh on players he feels aren’t coming back from injury soon enough, notably Mychal Kendricks and Wolff last year. Smith barely played last year — only 105 snaps, with 1/3rd of those on special teams — so it’s a puzzle how he was even able to get injured. 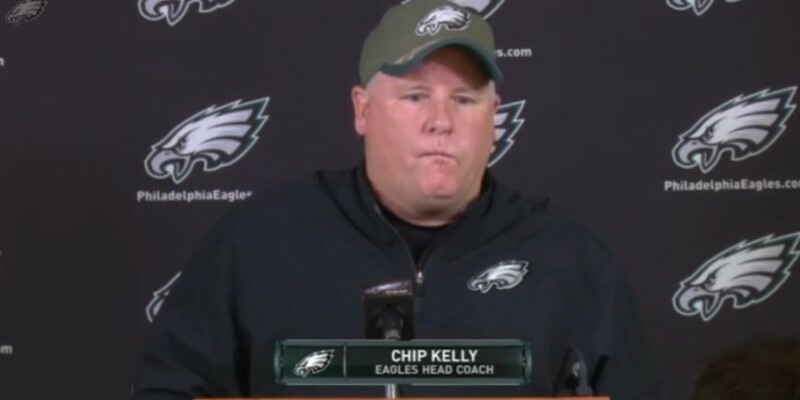 Kelly said he had “a leg pull,” which sound an awful lot like a statement that Smith was pulling the coach’s leg — or that Chip was pulling ours. 4) There will be an open competition at quarterback, though I wouldn’t bet any money on Matt Barkley or Tim Tebow. Sam Bradford hobbled around in a brace, but isn’t ready for even non-contact 7-on-7 scrimmages. For now, Mark Sanchez is the starter. Sam Bradford’s knee, the Eagles’ MVP . That doesn’t hurt me. I’m not governed by the fear of what other people say. Events don’t elicit feelings. I think beliefs elicit feelings. I understand what my beliefs are and I know how I am. COACH KELLY: You start chasing perception and you got a long life ahead of you, son. That’s what it’s all about. If you’re worried about someone else’s perception of what is going on with you, then … . You can control one thing. You can control yourself. I know how we run this organization, and it’s not run that way. And that’s why it’s so interesting covering coach Kelly.